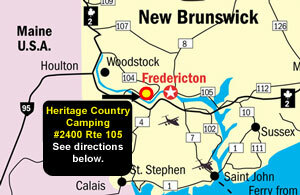 Directions from Fredericton: Take Highway 102 North. At the Mactaquac Dam, take the Route 105 exit. We are approximately 20 minutes on the right at #2400. Directions from Woodstock: From the Trans-Canada Highway (Route 2) at Hawkshaw, take Exit 231. Cross the Pokiok Bridge (one of the few suspension bridges in the province) to Route 105 South. We are on the left at #2400. Copyright © 2005  Website designed by PorterView Designs.